← And its only Monday…. Take one new lace project, add one new lace knitter, stir in 3 boys and one labrador and liberally sprinkle school holidays and wait patiently till disaster strikes. 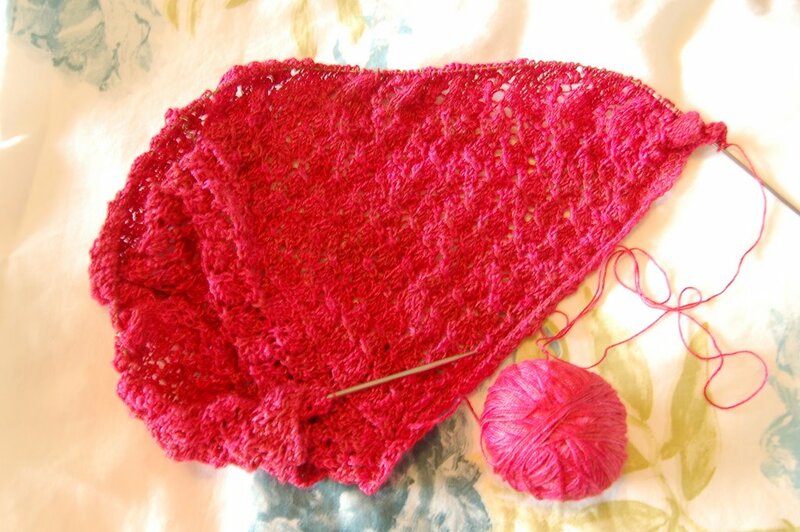 It doesn’t take long, there you are knitting away quite happily on your second shawl project, thinking all the while, you have this chart reading thing all sussed out. You get to the bit where you have to set up the first border chart, you think that you can do that while there are free range children and dog to distract you, wrong, its not going to work. So after 2 attempts and 2 froggings you throw it in the basket, where it taunts you incessantly, you of course, were too sure of yourself to add a lifeline after the main body part, na,na,na,na,na. Its not going to beat you because you want this shawl, its for you, there is no quitting! And to prove it you get up when its still dark and quiet and you beat the shawl pattern into submission….well kind of, two more charts to go, I just need to get out of bed at dark o’clock more often this week and we might get there. 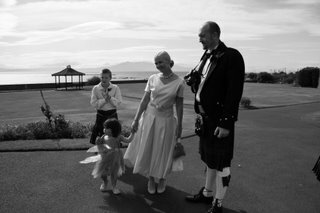 Today we celebrate our 19th wedding anniversary, I don’t have a wedding picture to scare you with so this was taken by my sister-in-law, I love it because its black and white, has some of my favourite people in it and one of my very favourite views of the west coast of Scotland with Arran in the background. Happy Anniversary Honey. Happy anniversary from here, too. That’s a very nice family you have – so masculine-looking to set off your pink dress (in the color picture, of course). I wish you three times as many happy returns of the day. congratulations Yvette & Honey!! and also bravo for beating the lace into submission! Happy anniversary! Hope you have a wonderful day Yvette! Wow, I’m impressed with the lace! congratulations on your wedding anniversary. 19 years is fabulous…maybe you should start angling for a round the world trip as your 20th anniversary present! australia is just lovely to visit. Happy Anniversary and many happy years more…..great color on the lace. India, thanks for making me cake to drool over for my anniversary. A trip to Australia sounds like a great plan, need to work on that one. As for the lace its almost done, maybe by tomorrow.